You donÃ¢â‚¬â„¢t need a permanent water supply for a hot tub or garden spa but you will need a suitable electrical supply to run the tub.Ã‚Â Hot tubs have a specific section in the 16th Edition IEE (Institute of Electrical Engineers) Regulations and fall into the same category as swimming pools. The Government introduced a new law in January 2005, which demands that most electrical work in UK households is only carried out by a Ã¢â‚¬Ëœcompetent’ person.Ã‚Â This law means that Electrical safety requirements have been included in a new Part P of the Building Regulations. – Suitably inspected and tested to verify that they meet the relevant equipment and installation standards . 1. Appoint an electrical contractor who is registered with a competent person scheme.Ã‚Â If you are unsure about who is Part P qualified visit the websites of the following organisations who all run Part P registration schemes.Ã‚Â Make sure that your contractor is registered with one of them. 2. Appoint someone who is not Part P registered but contact you local authorityÃ¢â‚¬â„¢s Building Control Department first.Ã‚Â The work will have to be inspected and tested by your local authority before it can be signed off.Ã‚Â There will be a charge for this service. TheÃ‚Â hot tubÃ‚Â should be protected by a sufficiently rated MCB (mains circuit breaker) and should cover the maximum amperage pull of the spa PLUS 25% to allow for brake torque (i.e. the extra rush of current when pumps are first started. )Ã‚Â So aÃ‚Â hottub that has a maximum current draw of 20 amps should be fitted with a 25amp MCB. TheÃ‚Â hot tubÃ‚Â should also be protected against earth faults by an RCD (Residual Current Device)Ã‚Â This is a trip switch which prevents danger of electric shock from damaged or waterlogged cables and connections.Ã‚Â A suitably rated 30mA RCD is recommended. Outdoor cabling should be protected from damage by either laying protective ducting (pvc pipe) below ground or by using Steel Wired Armoured (SWA) cable.Ã‚Â Your electrician will calculate the size of cable required depending on the loading and the distance from the mains supply.Ã‚Â 6mm2 3-core SWA cable is perfectly suitable in most cases but always consult an electrician first. 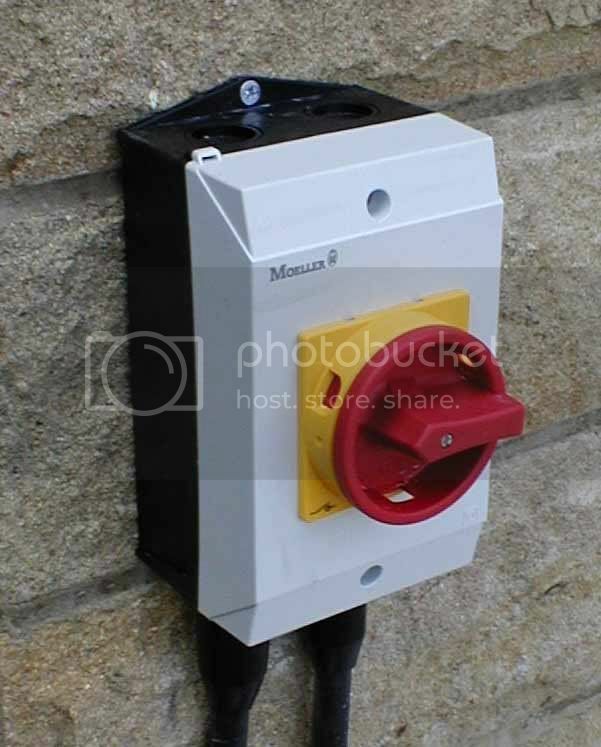 An IP65 45amp Rotary Isolation Switch is also recommended so that theÃ‚Â hot tubÃ‚Â can be isolated outdoors in an emergency or for service work.Ã‚Â This is simply a rotary on/off switch but should be sited more than 2 metres away for the hot tub so that bathers cannot be in the spa whilst touching the switch. 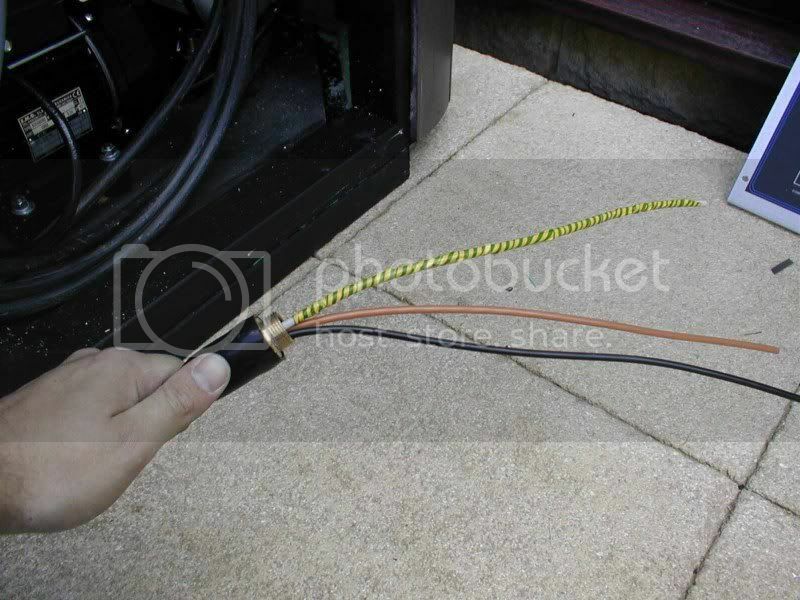 TheÃ‚Â hot tub supplyÃ‚Â can then beÃ‚Â directly hard wired into the load box inside the spa.Ã‚Â Waterproof gland packs should be used to prevent ingress of water on all outdoor electrical connections (2 at the isolation switch and 1 inside the hot tub)Ã‚Â Ensure that all earth cables are clearly colour coded with green/yellow insulating tape or earth sleeve. Once the hot tub is filled with water and the electrical supply is installed, your hot tub installation team should commission the hottub and check that everything is fully operational before “handing over” to you with a thorough training of how all of the hot tub features work. Hi there, iv’e been told that the earth should come from a 1mtr spike in the ground & not to the mains earth at all, could you please clarify this point for me, thanks Phil. Obviously consult a qualified electrician but our understanding is that the vast majority of hot tubs are earthed via the mains earth and also the armour of the armoured the cable. Let us know if you find out more about the earth spike. Great advice, thanks. Before I appoint an electrician are you able to give ball park figures – just to ensure I’m getting a fair price. It’s difficult to quote costs for installing hot tub electrics as there are a number of factors that will affect the price quoted such as the state of your home electrics/consumer unit, the length of armoured cable required and ease of routing it to the desired location including any groundwork required. Also the hourly rate of qualified electricians varies a fair bit around the country depending upon local demand and supply of contractors. However in our experience, most hot tub electrics jobs take between 1/2 and 1 day and therefore the cost including parts should be somewhere between Â£300 and Â£500 depending on the above factors and assuming that you don’t need any other work done on the house electrical system. Hope this helps. Hi,could you mention what the peak power allowances should be for a hot tub that uses a maximum of 14.8amps,would it be under 16 amps or over?? Hi Nick,many thanks for your reply I was wondering if you could look over some basic H/tub electric outputs a manufacturer has sent me from china,I am trying to see if this new model they are making would work from the UK 13amp without it fusing,I could send you there power info sheet if you had a way for me to send it to you. Thanks Meredith. Do you know, will a US manufactured spa (220V/60Hz) work on the UK electrical system? I have one that I can ship from the states inclusive with a move, but don’t want to bring it if it won’t work. Hi – im getting a hot tub and am told to buy 3 core swa cable. This is fine but i dont know what size to buy. Would 6mm be enough for a 20amp hot tub ? After careful check of the wiring, add water to the tub and fired it up. It shouldnâ€™t been damaged by either the winter or the installation. Good details given for regarding hot tubs. Thanks for the post. Hi I am hopingto install a hot tub. 32 Amps is the spec. distance from consumerboard to the tub will be about 25 meters. What size cable (armoured cos its buried) should I use? I have been told that 6mm SWA is suiatble. Most hot tubs dont pull as much current as per the manufactures state,I clamped one on full load heating and pumps and it was at 50 to 60% of the FLC as recomended. use an RCD protected supply and an over current divice MCB. I used 4mm 3 core rate the MCB accordingly to the cable and your fine. I have rewired a few hot tubs in my time and you will be supprised what you see. A grand canyon Spa Form Stating 32amps FLC wired in 2.5 3core SWA by a NICEIC Registered company. FLC was 17amps so its fine. Hot tub manufactures like to cover there back sides, most are made in the USA so lower the voltage higher the current usa 110 UK 230/240/250 depending on location. Can you supply a hot tub with power from a dist board, say in a shed, with other circuits, which is powered from the main house dist board?